Congratulations to Tammy Y., Trude V., and Bn100, the winners in Lara's giveaway. Thank you to all who participated! Someone has left a baby on the porch of search and rescue expert Ridge Colton's log cabin. Who? And why? A loner, Ridge knows nothing about caring for an infant. But when the woman who broke his heart years ago shows up to help, he's reminded of everything he once almost had. From a wealthy family, Dr. Darcy Marrow was dissuaded from loving the man whose name meant one thing in town: shame. 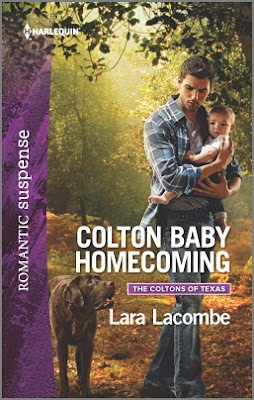 But with a dangerous thug trying to kidnap the baby, Ridge discovers how far he'll go to protect the little one, Darcy…and his long-guarded heart. This was a really fun book to write! Ridge works as a search and rescue operator with his partner, a chocolate Labrador named Penny. I had a blast doing the research for this profession, and I was amazed by what the search and rescue dogs are capable of doing, not to mention the close, intense bond that forms between a dog and its handler. I already think of my cats as 'furry people,' but these dogs take it to a whole other level! This book will always have a special place in my heart because I wrote it soon after giving birth to my first child. Ironically, the book kicks off with Ridge finding an abandoned baby on his front porch, so he too was thrust into the role of infant caregiver. My sleepless nights and other baby-related adventures definitely gave me some good fodder for Ridge and his new little one! I'm happy to offer 3 print copies of COLTON BABY HOMECOMING to commenters (US and Canada only, please). Tell me, do you have any pets? Ridge talks to Penny a lot, and I know I talk to my cats all the time. Do you have conversations with your critters, or is it just me? Giveaway ends 11:59pm EST March 4th. Please supply your email in the post. You may use spaces or full text for security. (ex. jsmith at gmail dot com) If you do not wish to supply your email, or have trouble posting, please email maureen@justromanticsuspense.com with a subject title of JRS GIVEAWAY to be entered in the current giveaway. I have a furbaby named Sammie and he's a great listener ;) I sometimes have to bribe him with dog cookies but he doesn't mind when I talk! Thanks for sharing! It's always nice to share a treat with a friend! Congrats on the new kitty! Waving from Oklahom. I have a rescued beagle, Bella (who rescues me right back), and a cat, Gizmo. We chat all the time and they even understand most of it....no really!...LOL. Love reading your books Lara. This one sounds great! You're so right--we think we're saving them, but really, it's mutual! I have a cocker spaniel...I've had dogs forever, usually more than one. This sounds like a wonderful book!! Thanks, Trudie! We had a dog when I was a little kid, but it's been cats ever since for me! Yay Greyhounds! They're so elegant! My pets are tropical fish. Not the best pet for company but they are interesting to watch. Yes, I do talk to them. Not a lot because they swim away so obviously not interested in humans. I love watching fish--it's so peaceful!